Amazon.com now offers searchable interior pages on their website. I think this is a great technology, especially I found some new books that mentioned George Pérez (like The Best of Draw! Volume 1 (Best of Draw!) or The DC Comics Guide to Coloring and Lettering Comics). Oh, also, you need to sign up with amazon in order to view interior pages... which I'm sure a lot of people out there already have an account with them. Anyway, the best news is that you can now read pages 126-132 of The Thunder Agents Companion. If you don't want to click 126 times to get to that page, just do a search for "Perez" and jump right in at page 126. The T.H.U.N.D.E.R. Agents Companion, released on September 28th, includes an interview with George. The heroes who never die! Though the T.H.U.N.D.E.R. 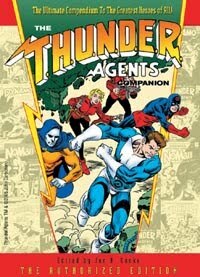 Agents had a relatively short life during their initial run in American comics during the 1960s, you just can’t keep a good team down as evidenced by their periodic revivals over the years, and this is the authorized - and definitive - book on the history of such memorable characters as Dynamo, No-Man, Lightning, Andor, the Iron Maiden, and all the other super-heroes and super-villains created by the late, great Wallace Wood and company! To celebrate the team’s 40th anniversary, included are interviews with Woody’s creative team, as well as those superb writers and artists involved in the various T-Agents resurrections over the decades, and a detailed examination of the origins and exploits of the characters themselves, including the shocking truth behind the first super-hero to ever be “killed,” Menthor, the master of mental force! This exclusive book, the perfect compendium to sit alongside of the recently-published T.H.U.N.D.E.R. Agents archive volumes, also features reams of artwork, much of it rarely-seen or previous unpublished, including a rare 28-page T-Agents story drawn by Paul Gulacy, unpublished stories by Gulacy, Paris Cullins, and others, all behind a Jerry Ordway cover. The Higher United Nations Defense Enforcement Reserves forever! This product will be in stock on Wednesday 13 July, 2005. The heroes who never die! Though the T.H.U.N.D.E.R. Agents had a relatively short life during their initial run in American comics during the 1960s, you just can't keep a good team down as evidenced by their periodic revivals over the years. This is the authorized and definitive book on the history of such memorable characters as Dynamo, No-Man, Lightning, Andor, the Iron Maiden, and all the other super-heroes and super-villains created by the late, great Wallace Wood and company. To celebrate the team's 40th anniversary, this book includes interviews with Woody's creative team, as well as those superb writers and artists involved in the various T-Agents resurrections over the decades. Plus, a detailed examination of the origins and exploits of the characters themselves, including the shocking truth behind the first super-hero to ever be "killed," Menthor, the master of mental force! Also, reams of artwork, much of it rarely-seen or previous unpublished, including a rare 28-page T-Agents story drawn by Paul Gulacy, unpublished stories by Gulacy, Paris Cullins, and others. Cover by Jerry Ordway. TwoMorrows Publishing has announced that it will release the T.H.U.N.D.E.R. Agents Companion in May, in conjunction with the 40th anniversary of the property. The 192-page 8" x 11" trade paperback will include interviews with members of the original and subsequent creative teams, an examination of the history of the property (which has had numerous revivals since its initial run in the 60s), a rare 28-page story by Paul Gulacy, and previously unpublished stories by Gulacy, Paris Cullins, and others, all behind a Jerry Ordway cover.